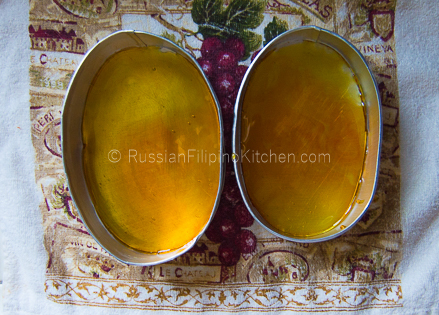 I finally found the perfect recipe for making leche flan using whole eggs! 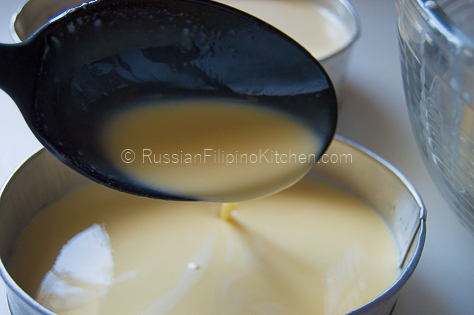 Yay, I am so excited to show it to you guys so you too can start making it, and don’t have to stick to making this famous Filipino dessert just with egg yolks. The original recipe is from Kusina Ni Manang which you can find here. I adjusted the ingredients based on what’s available. Her recipe calls for a 15 oz can of evaporated milk which I can’t find anywhere, so I stick to the 12-oz Carnation evap. I also modify the process a bit like straining the egg-milk mixture to get rid of the bubbles after pulsing in the blender, and steaming the flan instead of using the water bath method. I find her technique of making the caramel in the microwave pure genius! So easy and very convenient. Thank you Manang for sharing your tips and techniques! I tell you guys, I am so pleased with the result that this is going to be my favorite way of making leche flan from now on. Don’t get me wrong. The yolk-only version (check the recipe here) is equally rich and delicious, as well as smooth and creamy in texture. 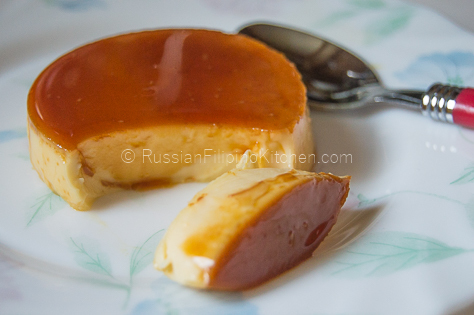 It’s perfect for those who prefer their flan very rich and dense. 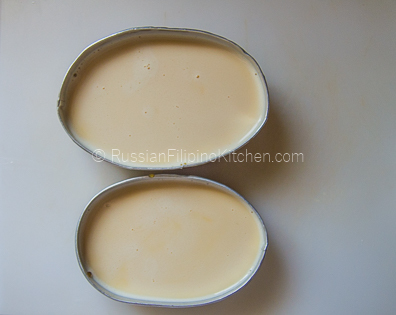 This whole eggs leche flan is smooth, creamy too, with just the right amount of sweetness, but with no “egg-y” aftertaste. I happen to like it better that way. 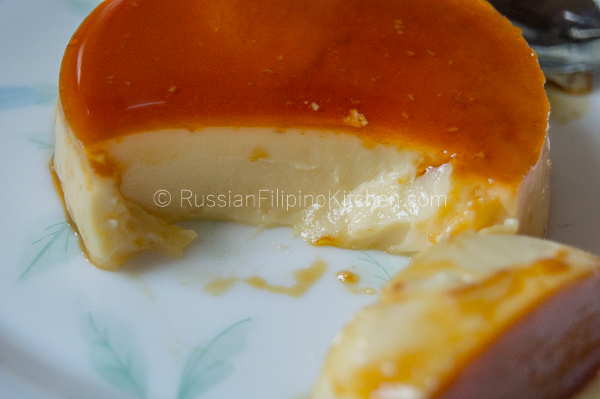 This recipe uses the typical Filipino aluminum mold called “llanera” in making the flan. Of course you can use any mold you wish. Just be aware that the size and thickness affects cooking time. 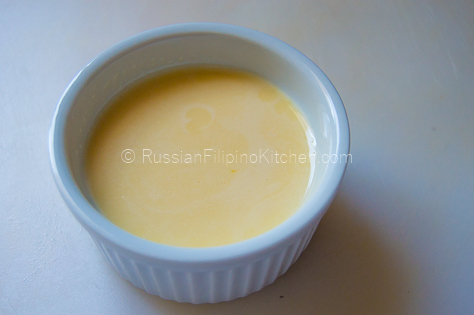 I use one XL llanera mold, one Large, and one 4 oz ramekin for this recipe tutorial. But this recipe will yield 2 XL size llanera. Feel free to use any mold of choice. This is the easiest way to go if you have a microwave oven. 1. Prepare llanera molds. Place a towel or trivet on the bottom to protect your countertop. 2. 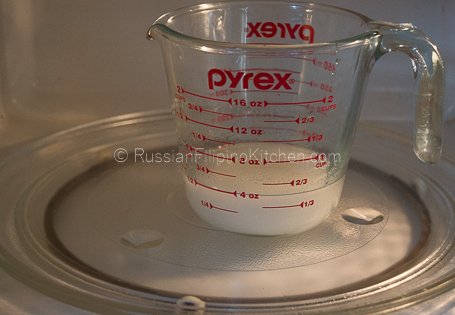 Place sugar and water in a microwave-safe glass with handle (I use Pyrex). 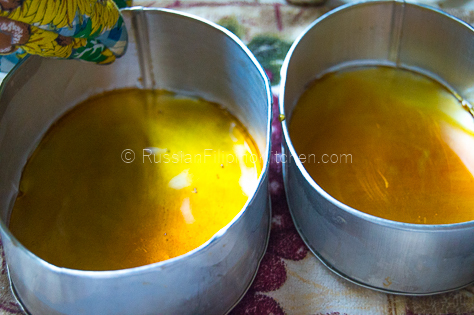 Stir with a spoon or fork until thoroughly mixed. 3. Place Pyrex glass in the microwave and set timer to 4 minutes. Please note that microwave settings vary, so it’s important you pay close attention while making the caramel or you’ll burn it. It took 4 minutes and 30 seconds to get the right caramel color using my microwave. Check out Manang Kusinera’s video on how to do it properly. 4. Use a potholder to hold the Pyrex glass and empty contents onto individual aluminum molds. Be careful, the caramel is VERY HOT, it can burn you! 1. Combine sugar and water in a sauce pan and dissolve on low heat. Stir constantly and pay attention as it melts; you don’t want to burn it. As sugar turns to light brown, turn off heat. Divide and transfer quickly to individual molds. If you’re using a llanera, use a kitchen tong to hold it as you’re pouring the caramel because it can get very hot. Tilt the mold when needed to distribute evenly on the bottom. Set aside to cool and harden while you prepare the egg-milk mixture. 2. Alternately, place ¼ cup sugar on each llanera. Turn on stove to low and using a tong to grip the mold, melt the sugar directly over the flame till it turns caramel in color. Swirl llanera around to evenly distribute caramel. Repeat same with second mold. 1. Fill steamer with enough water (about 3-5 cups). Bring to a boil then lower heat to LOW (numbers 2-3 in your stove dial). 2. 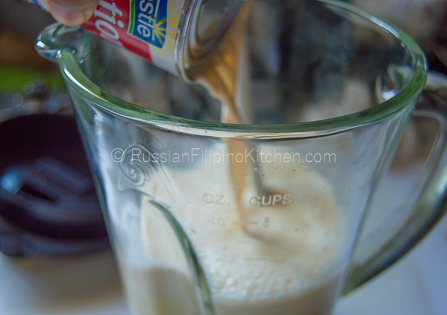 Add sweetened condensed milk, evaporated milk, eggs, and vanilla extract into the blender. Cover and “pulse” for 10 seconds until a uniform mixture is achieved. You will see lots of bubbles, but don’t panic! You can always strain the mixture, like I did. Manang Kusinera didn’t mention the straining part, but I just did so because I want my flan smooth without any air pockets visible. 3. Strain the mixture at least 3 times until you got rid of some impurities from the eggs and the bubbles have diminished. 4. Transfer egg-milk mixture onto individual molds using a ladle. Use your fingers to pop up any stray bubbles on the surface. 5. Cover each llanera with aluminum foil and arrange in the steamer. 6. Just for demonstration, I decided to use a small ramekin in addition to the aluminum molds in this post. I microwaved the caramel directly in the ramekin, poured the mixture, covered it with aluminum foil, and placed it in the steamer with the rest. To make the caramel, mix 2 tablespoons of white sugar and 1 tablespoon water and microwave for 1 ½ – 2 minutes until sugar turns amber in color. 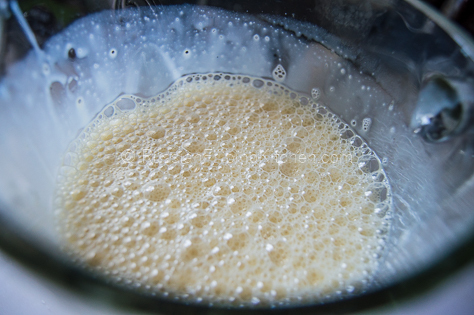 Allow to harden first before adding the egg-milk mixture, about 1-2 minutes. 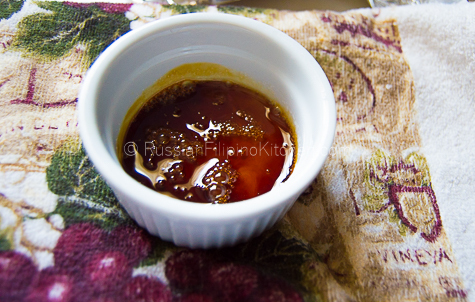 Make sure to use an oven mitt or potholder to grab the ramekin from the microwave and to set it on a towel or trivet. 7. Cover steamer and steam for 30 minutes for the ramekin, 45 minutes for large size llanera, and 1 hour for XL. To check for doneness, insert a toothpick into the mixture. It should come out clean. Remove from steamer and allow to cool, still covered. When it reaches room temperature, refrigerate overnight to help set. 8. When ready to serve, run a knife around the edge of mold or ramekin and invert onto a serving plate. Prepare llanera molds. Place a towel or trivet on the bottom to protect your countertop. 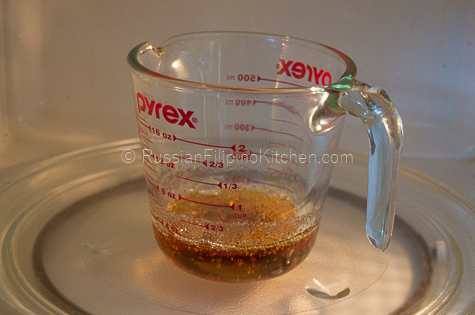 Place sugar and water in a microwave-safe glass with handle (I use Pyrex). 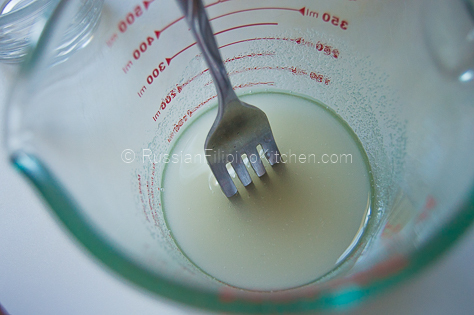 Stir with a spoon or fork until thoroughly mixed. Place Pyrex glass in the microwave and set timer to 4 minutes. Please note that microwave settings vary, so it’s important you pay close attention while making the caramel or you’ll burn it. In my microwave, it takes 4 minutes and 30 seconds to get the right caramel color. Check out Manang Kusinera’s video below on how to do it properly. Use a potholder to hold Pyrex glass and empty contents onto individual aluminum molds. Use extreme caution as the caramel is VERY HOT and can burn you! Work quickly as the caramel hardens fast as soon as it touches the mold. 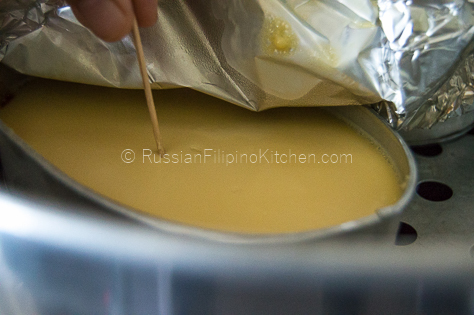 Use a tong or with gloved hand, grab the llanera and swirl it around to distribute the caramel evenly on the bottom. Set aside while you prepare the custard mixture. Combine sugar and water in a sauce pan and dissolve on low heat. Stir constantly and pay attention as it melts; you don’t want to burn it. As sugar turns to light brown, turn off heat. Divide and transfer quickly to individual molds. If you’re using a llanera, use a kitchen tong to hold it as you’re pouring the caramel because it can get very hot. Tilt the mold when needed to distribute evenly on the bottom. Set aside to cool and harden while you prepare the egg-milk mixture. Alternately, place ¼ cup sugar on each llanera. Turn on stove to low and using a tong to grip the mold, melt the sugar directly over the flame till it turns caramel in color. Swirl llanera around to evenly distribute caramel. Repeat same with second mold. Fill steamer with enough water (about 3-5 cups). Bring to a boil then lower heat to LOW (numbers 2-3 in your stove dial). 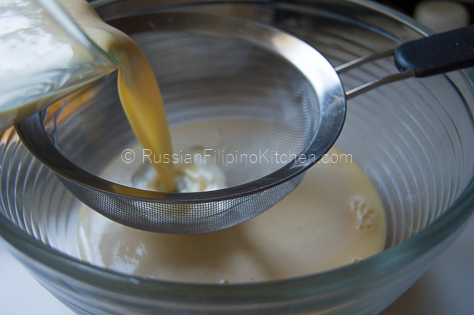 Add sweetened condensed milk, evaporated milk, eggs, and vanilla extract into the blender. Cover and “pulse” for 10 seconds until a uniform mixture is achieved. You will see lots of bubbles, but don’t panic! You can always strain the mixture, like I did. Manang Kusinera didn’t mention the straining part, but I just did so because I want my flan smooth without any air pockets. Strain the mixture at least 3 times until you got rid of some impurities from the eggs and the bubbles have diminished. Transfer egg-milk mixture onto individual molds using a ladle. Use your fingers to pop up any stray bubbles on the surface. 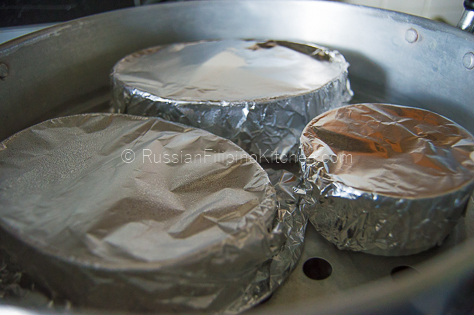 Cover each llanera with aluminum foil and arrange in the steamer. 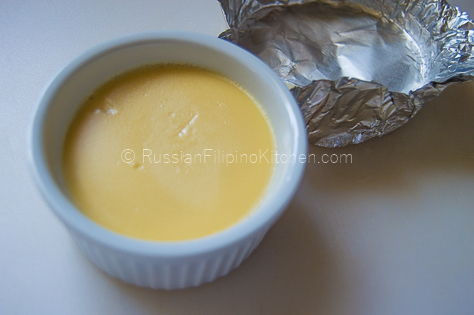 Just for demonstration, I decided to use a small ramekin in addition to the aluminum molds in this post. I microwaved the caramel directly in the ramekin, poured the mixture, covered it with aluminum foil, and place it in the steamer with the rest. To make the caramel, just put 2 tablespoons of white sugar into the ramekin together with 1 tablespoon of water and microwave for 1 ½ - 2 minutes until sugar turns amber in color. 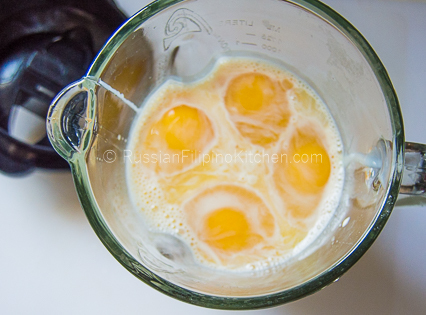 Allow to harden first before adding the egg-milk mixture, about 1-2 minutes. Make sure to use an oven mitt or potholder to grab the ramekin from the microwave and to set it on a towel or trivet. Cover steamer and steam for 30 minutes for the ramekin, 1 hour for large size llanera, and 1 hour 15 minutes for XL. To check for doneness, insert a toothpick into the mixture. It should come out clean. Remove from steamer and allow to cool, still covered. When it reaches room temperature, refrigerate overnight to help set. When ready to serve, run a knife around the edge of mold or ramekin and invert into a serving plate. Disclaimer: Post contains affiliate links to products I use and love! You’re welcome! Hope it turns out great. Hello, Leila! So sorry for the late reply. Your comment went to my Spam folder so I didn’t notice it till now. How do you mean the bottom of the flan looks like? Could be the syrup didn’t set well? Did you allow the flan to cool first and refrigerate overnight? 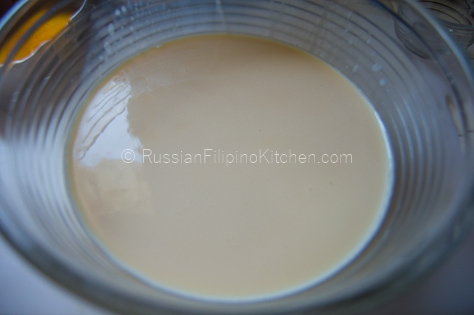 This helps contribute to a more successful leche flan that doesn’t stick to the bottom. Hope that helps. You can always message me thru my Facebook page or directly at russianfilipinokitchen (at) gmail.com. Have a great day! hi what if i want to make 20-30 llanera’s ? what should i do ? pls reply thank you. You adjust the recipe depending on the size of the llanera. Okay, I’ve got to try this. Love the idea of putting everything into a blender. And I’m with you, straining is the way to go. Also, love the microwave for the caramel sauce. Thanks for the share. great!! !no waste..will try this on my son’s birthday tomorrow..as per his special request..thanks for sharing.. Thanks! However, I’m interested in your description of “very soft bread-like flan”. Can you tell me more? 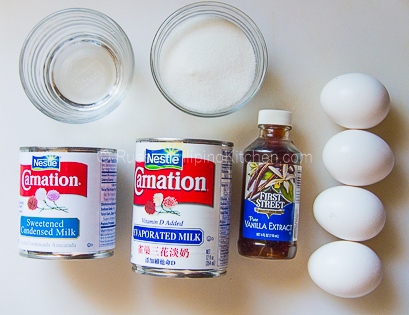 Were i can find the other recipe using 12 whole eggs? Hi there. I have been browsing the net looking for something to make for dessert for tonight and chanced upon your Leche Flan post curious of using whole eggs, not wanting to have to worry of what to do with the egg whites tonight. The flans taste nice. They have a slightly different texture (slightly firmer to the touch) I think because of the incorporation of white eggs. I used small small tin containers which I lightly greased so I only had to steam them for 20 minutes, and they came out perfect. Thanks for sharing your recipe! I’m so glad you enjoyed the recipe! Thanks for stopping by and leaving such nice comment! Wow..ready to try this. Got all my ingredients….soooo excited…thanks for sharing ms mia! cool..i’ll try it soon coz it’s my favorite..im sure my son will love it too. I will definetely try this!thanks for sharing! Hope your leche flan turns out great! Happy cooking! This is an awesome recipe! Thank you so much for sharing! This is my very first attempt making a flan and I should say I did pretty good. I wish I can take a picture of my flan. I used one of my bread pan and I steamed the flan for 40 minutes. That’s so great to hear! Thanks for the positive feedback! Hi, this is actually my first time to try cooking it cause I normally just order but this time I will try making this. I didn’t want to use vanilla and saw your recipe, hope it will turn out good. Thank you for posting. This is my first time to try this and Oh my, I forgot the water for caramelized sugar.and so it is so hard. Haha. But the custard went well. Thanks! Glad it turned out well! I’ve always tried the water bath the last time my flan came out with way too many air pockets, the flav was great but I want a smoother creamier texture! Also idk what you mean by a steamer, what’s a steamer? I’ve always placed a dish Into a bigger disj with an inch of water and baked in the oven? 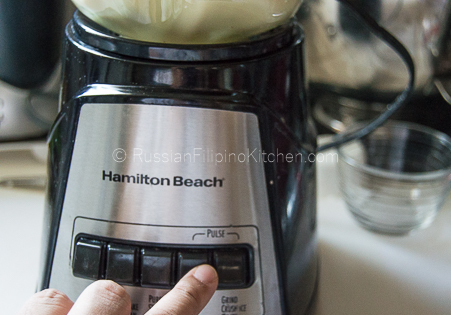 pwede po gawin yan kahit walang blender?pwede po ba yung manual na paghahalo lang?thank you .. I think it will be okay. Haluin mo lang maigi & make sure to strain the mixture. Hello! Are you talking about the steamer insert in the rice cooker? That works fine. Did you try to double the recipe? The recipe has precise ingredients in order to achieve the best results. can i bake this? like i’ll put the llaneras that are covered in foil in a bigger pan and pour in about an inch of water and bake it for about an hour at 180c? can i do that? Hi… I have a blender but I just really hate using one HAHAHA…. If i will use the whole egg recipe, do i really have to use a blender? Cant I just mix it until smooth? thanks…. You can do it by hand. The blender just makes it easier. Hi, how can I get rid of the eggy taste? hi, thank you for sharing this recipe!!! i made this a couple of times already and it always came out perfect, i also used this recipe for custard cake!!! my family & friends loved tge taste!!! thank you for sharing this easy and delicious recipe!!! i made this a couple of times already and it always came out perfectly!!! i also used this recipe for my custard cake and it was a pleaser! Hi there, I didn’t really understand your question. Can you explain it more? Thanks! Hi Mia! This is a great recipe!I’ll try this next time. May tanong lang po ako paano ba malalaman na over cooked na yung leche flan? pag tinutusok ko kasi ng toothpick may buo buo ng kasama.. 🙁 I use electric steamer and XL size ang gamit kong llanera so I cook it for avout 30 min. Hope you’ll help me with this. ? Looks like na overcook na nga yung flan mo. Best way to tell na luto na is yung malinis yung toothpick pag tinutusok mo, or you can gently jiggle the flan after the recommended cooking time. It should move a little na parang jello. That means pwede na alisin sa lutuan.